Although the water level was quite low when we hiked the No Thoroughfare Trail, I know that sometimes there is no water at all. 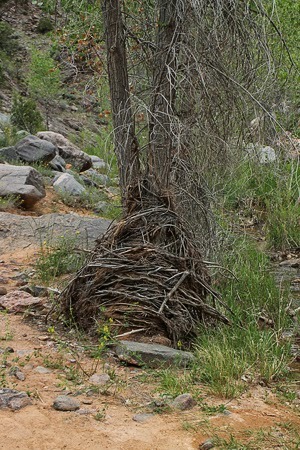 And this photo of a tree with tree branches around it is evidence that sometimes the water level is quite high. The branches appear on only the upstream side of the tree so are obviously carried down the river. There were several trees with these branches so this one wasn't a fluke. Interesting, huh? !